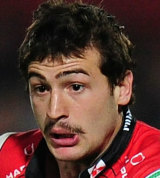 Jonny May is a versatile outside back with a remarkable turn of pace and a bright future ahead of him. May was one of a band of young Enlgish players, including Freddie Burns, Henry Trinder and Charlie Sharples, to graduate into the Gloucester first-team squad as well as representing England under-20s together. He made his full Gloucester debut in the Heineken Cup against the Dragons in 2009 and continued to earn rave reviews as the took on greater responsibility in the Gloucester backline. However his versatility threatened to undermine his chances of gaining a regular first-team slot as he was shunted around from wing to fullback and centre. May's electric form in late 2011 and early 2012 earned him a call up to the England Saxons squad to face the Irish Wolfhounds. May was awarded the Try of the Year at the Aviva Premiership Rugby Awards for his sensational solo score against Harlequins in February, 2012.